The 2016 Buick Verano is a confident and capable compact four-door luxury sedan. Despite being smaller than its popular LaCrosse sibling, the Verano doesn’t downsize the things you love most about Buick cars, namely their smooth ride, premium interiors, and fun-to-drive turbocharged engines. The 2016 Buick Verano blends power with refinement in a way that’s uniquely Buick. Its standard engine is a 2.4-liter that generates 180 horsepower and 171 pound-feet of torque. Power is sent to the front wheels through a smooth-shifting six-speed automatic transmission. While the standard 2.4-liter is capable of delivering thrilling performance, drivers looking for truly exhilarating drive will definitely want to explore the top-of-the-line turbocharged 2.0-liter four-cylinder. It delivers 250 horsepower and serves up 260 pound-feet of torque, and can be had with either a six-speed automatic or a six-speed manual. Regardless of engine choice, though, one thing is for certain: the 2016 Verano was built for comfort and long-haul cruising. It handles rough surfaces with ease, and ensures ride quality is always supple and supremely quiet, even at highway speeds. The attributes only serve to reinforce the Verano’s luxury credentials, and when coupled with the its composed handling and precise steering, it’s no wonder the Verano continues to win customers over with its many charms. The 2016 Buick Verano comfortably seats five and is offered in six trim levels: 1SV, the Verano Group, Convenience Group, Sport Touring, Leather Group, and Premium Turbo Group. Standard features include 17-inch alloy wheels, cruise control, automatic climate control, and eight-way adjustable front seats. Also included standard are OnStar® telematics (with 4G WiFi connectivity) and a six-speaker audio system—complete with CD player and a USB port. The next step us is the Verano Group, it incorporates all the previous trims standard features but adds remote engine start, a leather-wrapped shift knob and steering wheel, and a host of additional tech, including Buick IntelliLink, a rearview camera, Bluetooth®, and smartphone app integration. As its name suggests, the Convenience Group incorporates a number of features that make your drive easier and more comfortable, these include power and heated front seats, heated side mirrors, and a number of advanced driver aids, such as rear parking sensors, a blind-spot monitoring system, rear cross-traffic alerts, lane departure warning, and a forward collision warning system. The Leather Group adds all the Convenience Group’s features (where applicable) and throws in leather upholstery, a heated steering wheel, and a nine-speaker Bose® audio system. Finally, the Premium Turbo Group subs in a more power turbocharged engine and adds a rear spoiler, along with all the equipment from the Convenience and Leather trims. The 2016 Verano forgoes the more ostentatious styling seen on many of its European rivals, and instead opts for an athletic yet elegant exterior design aided by Buick's waterfall grille, gently rising beltline, and athletic stance. There are also traditional Buick styling cues, such as aesthetic "portholes" atop the hood directly beneath the windshield pillars. Meanwhile, Turbocharged Veranos are the sleepers of the line, preferring their performance do the talking, with just a subtle "T" badge on the trunk and dual exhaust outlets to visually indicate their extra muscle. 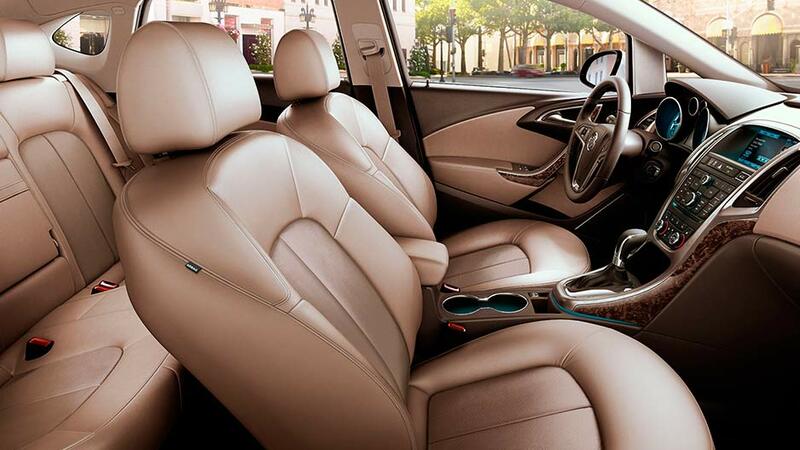 Step inside and the Verano boasts an interior that is replete with high quality materials and seating design to keep occupants comfortable for long stretches of road. Speaking of comfort, the driver’s seat is especially impressive, with additional bolstering that keeps you snugly in place during turns. The Verano’s interior sports a lot of touches that underline the car’s desire to cater to the needs of both drivers and passengers. The center console sweeps upward and places controls within easy reach, while the 7-inch touchscreen (standard on all but the SV) presents information in large, legible characters. The arrangement of its icons can even be customized, similar to how one would on a smartphone or tablet. When it’s time to pack in groceries and luggage – in addition to family and friends – you’ll be happy you selected this premium sedan. The Verano boasts 15.2 cubic feet of trunk space, which is an impressive capacity for this class. 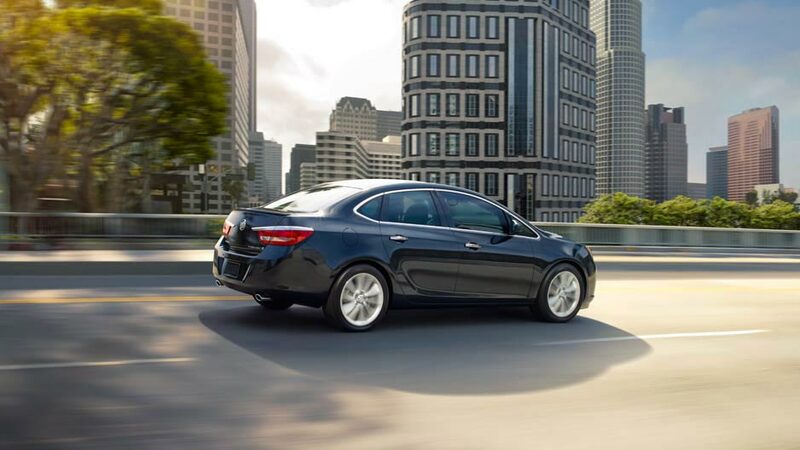 Safety should never be “a luxury,” which is why the 2016 Buick Verano boasts a robust list of standard safety features. Every Verano model includes antilock disc brakes, traction and stability control, front and rear side airbags, full-length side curtain airbags, and front seat knee airbags. Drivers can also select additional safety features, such as blind-spot, forward-collision, lane-departure and rear cross-traffic warning systems. The 2016 Verano also comes standard with OnStar®, which provides automatic crash notification, on-demand roadside assistance, and stolen vehicle assistance. The 2016 Buick Verano provides all the elements that make a top luxury sedan, like outstanding performance, a comfortable ride, and wide array of convenience and safety technologies—all at a price that won’t sap your bank account. Of course, words can only do so much, which is why we welcome you to contact us online or visit Rivertown Buick GMC at 1661 Whittlesey Rd, Columbus, GA 31904 to schedule a test drive of the 2016 Buick Verano.